The Avengers opens this weekend and it is truly wonderful to see a new generation discover all those old Marvel Comics heroes. My personal favourite was/is Thor (the new guy looks pretty skookum half-dressed). But that’s another story. 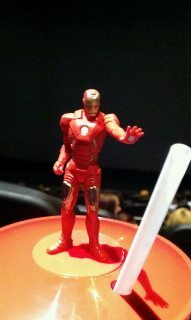 Tony Stark about to annihilate a straw. Poor straw! It’s Friday, Takeout Day in the Kirby house. What to have? We did the fish and chips last week. A&W? I like the Prime Rib Burger or maybe Chubby Chicken strips. Actually, I don’t think they’re called “Chubby” anymore. I guess calling heavily flavoured, breaded, deep-fried chicken, “Chubby” gives the wrong marketing image. The strips are really tasty, though. Let’s see. Norm doesn’t like Thai. I like Thai. Maybe Chinese food? Norm likes all the old standards: sweet and sour pork; fried rice; chow mien; deep-fried prawns and breaded almond chicken. The problem is, these are the ones most people order so they are made in bulk and kept warm then served out. I like the things they have to make fresh like: egg foo yung; black been chicken; Szechuan chicken and fresh cashew chop suey. And, to add to the dilemma of what to order, our favourite Chinese restaurant closed. I like Greek, Norm doesn’t care for the take out. Norm like chicken, too, Kentucky Fried or Nando’s. The KFC locally is not so great about changing their oil so it’s iffy at the best of times. I like Nando’s flame broiled chicken with the Medium Peri Peri sauce and roasted veggie side! It’s a possible. We haven’t had Pig for a while. It’s a BBQ place that has great ribs, pulled pork, brisket and fried chicken. None of it is good for you but sooooo wonderful but I made pulled pork for supper last Sunday. I don’t feel like Mexican. Subway? Hell, I can make sandwiches. The idea is for me not to cook. Nice scam, isn’t it, especially since I’m not even working right now. What would Ironman do? Tony Stark has to keep in shape or he won’t fit into that amazing suit. Of course, he is unbelievably rich so he could have a bunch of suits in different sizes. Just imagine his “fat” and “skinny” suits. Besides, the HULK is the only one allowed to be “BIG”! So what would Ironman order for takeout? Pizza? ~ by 1fatgirlshrinking - Diane Kirby on May 4, 2012. There’s a new Thai restaurant in the old Garlic Rose location, Goldstream and Jacklyn Road I think. They make a papaya shrimp cashew salad that looks incredible. Their coconut curries are so delicious. Anyway, I recommend that place and they do have interesting salads. Thanks, Caroline. I’ve actually had the Papaya Shrimp salad at Subai Thai. I like Thai but Norm doesn’t. We’re kinda like the one-stop dinner shop with me not-so-mobile ad Norm working all day! It’s be Chinese but with the sweet and sour on the side for freshness! I’ve eaten there. I like Thai, Norm doesn’t. Thanks for the recommend! SO happy Friday to you!